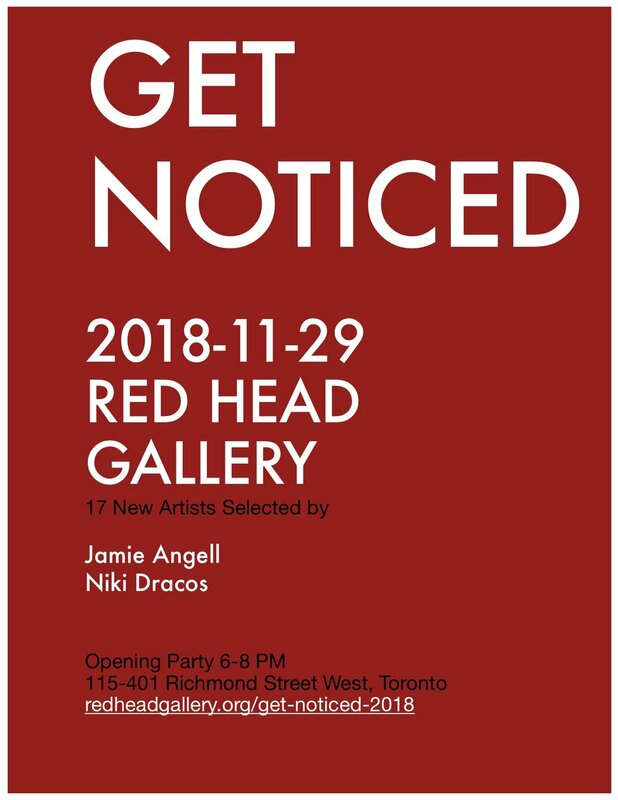 The Red Head Gallery is pleased to present Get Noticed, our biennial exhibition of visual artists selected by Toronto gallerists noted for actively raising the bar for Canada’s commercial art world. Artists have been selected by Jamie Angell of Angell Gallery and Niki Dracos of General Hardware Contemporary. The exhibition will be on view at the Red Head Gallery from November 28 to December 15, 2018. JAMIE ANGELL is founder and owner of Angell Gallery, dedicated to presenting art collectors and enthusiasts with thoughtfully curated and engaging exhibitions of contemporary art. Representing emerging, mid-career and senior artists, Angell Gallery showcases a wide range of media, from painting, drawing and sculpture, to photography, installation and video. NIKI DRACOS is Principal and Director of General Hardware Contemporary, founded in 2010 and located in Parkdale, Toronto. GHC brings new artistic talent to showcase alongside established provocateurs, Canadian and international. Also on November 29th 2018, the Magic Gumball Machine of Fate will make its debut at the reception of Get Noticed. The Magic Gumball Machine of Fate is an artist multiples project that distributes work by Canadian creators and makes art affordable for everyone. It is curated by Toronto artist Catherine Heard.